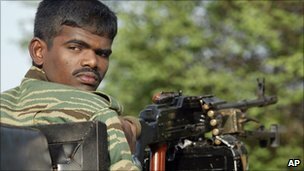 The Sri Lankan government rejected a surrender offer by Tamil Tiger rebels at the end of the war, reports released through the Wikileaks website say. They say that Defence Secretary Gothabaya Rajapaksa dismissed US pressure to allow a mediated surrender with the words "we're beyond that now". The leaked US cables suggest requests for the International Red Cross to go into the war zone were refused. Sri Lanka's government has repeatedly denied all these accusations. The Sri Lankan civil war came to an end in May 2009 with the death of their leader Velupillai Prabhakaran after the Tamil Tigers made a last stand in the north-east of the island. The leaked US documents - which appeared in the Norwegian newspaper Aftenposten - say that on 16 May 2009 the Norwegian ambassador called his US counterpart to report that he had received a phone call from Selvarasa Padmanathan - known as "KP" - stating that the rebels were prepared to surrender without conditions to a neutral third party. Correspondents say that although Padmanathan was abroad at the time, it would not have been unusual for him as rebel head of foreign relations to make the offer. The documents say that the US ambassador then called the International Red Cross (ICRC) who told him that their staff were prepared to go into the conflict zone by military helicopter to mediate a surrender. ICRC head of delegation Paul Castella is quoted in the document as saying that Defence Secretary Gothabaya Rajapaksa initially agreed to the arrangement, but first wanted the names of the rebel leaders who were prepared to surrender. But the documents say that "despite helpful efforts from Norway" the rebels failed to provide such a list. The documents say the government rejected repeated US requests to allow the ICRC into the conflict zone to help many dead and wounded civilians there. According to the US cables, presidential adviser Basil Rajapaksa "energetically refused" to give the ICRC permission, accusing it of failing on "three consecutive days to evacuate the wounded, even though the Additional Government Agent had said it was safe to do so".